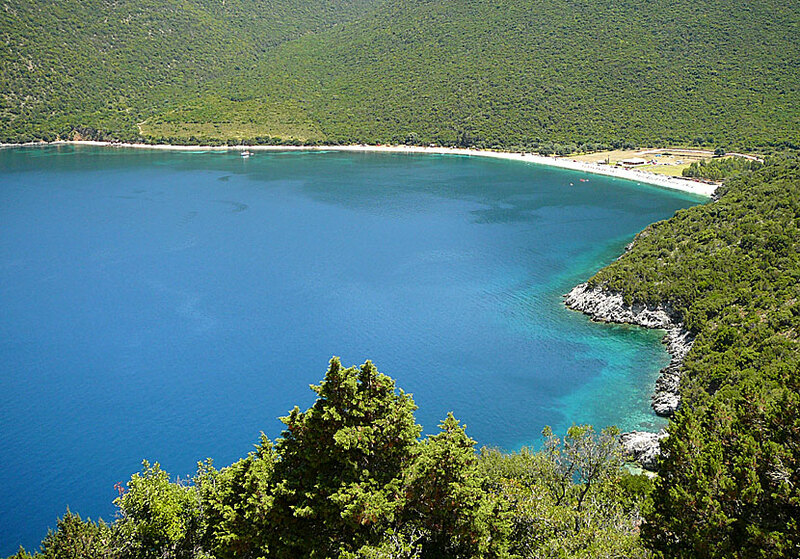 Antisamos in Kefalonia. Captain Corelli's Mandolin. Antisamos beach, set in an incredibly beautiful wide bay where the bright blue sea and the white pebbles merges with the hills and mountains clothed in green. It is an amazing sight that meet you when you drive the winding road down to the beach. The view is almost as spectacular as the view over Myrtos beach. At the beginning of the beach lies a cantina where you can buy sandwiches, drinks and ice cream. A little further away lies a taverna. Parts of the film of Captain Corelli's Mandolin was filmed here. Perhaps that is why Antisamos is so popular. In summertime it is crowded with people, try to arrive early, otherwise you may have problem to park the car. Antisamos is located about 4 kilometres northeast of Sami. You get here with private vehicle. There are some hotels pretty close to the beach, more accommodation is available in Sami.